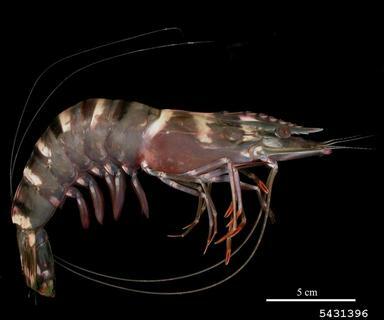 Giant Tiger Prawn: This large shrimp, also known as the Asian Tiger Shrimp and the Black Tiger Shrimp, can reach lengths between 8-12 inches. It resembles are native edible penaeid shrimp but differs in that it has distinct black and yellow stripes. It was brought to the U.S. from the Indo-Pacific region as an aquaculture product. There was an accidental release of 2,000 animals from a South Carolina farm in 1988. Reports of this shrimp in the wild have increased over time. They have been found in all Gulf coast states and there has been at least 1 record in each of the Florida Panhandle counties. The impact of this shrimp to our area is still unknown but they have a high tolerance for salinity change and consume many types of benthic invertebrates. It is thought that they could become serious competition for our native penaeid shrimp and could possible transmit diseases. If you think you have found one of these shrimp, record size location (GPS preferred), and email information to ExoticReports@MyFWC.com. To learn more about this species view the USGS factsheet. For more information contact the author Rick O’Connor, UF/IFAS Escambia County Extension – Sea Grant and Marine Science Extension Agent, 850-475-5230. 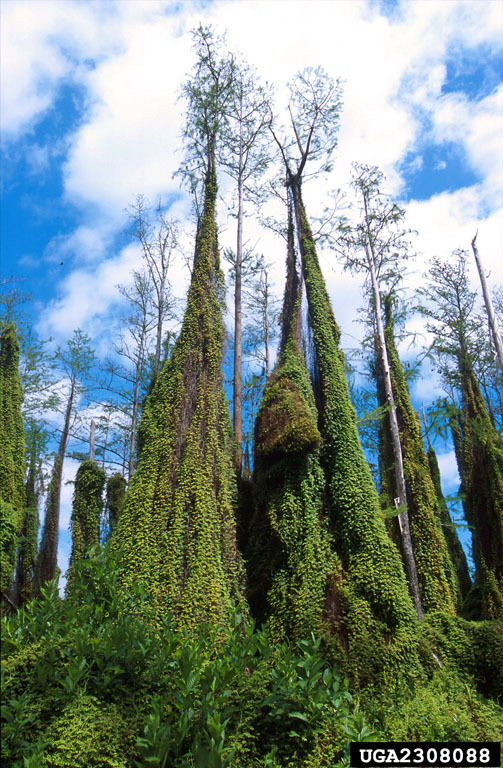 Japanese Climbing Fern (Lygodium japonicum) and Old World Climbing Ferns (Lygodium microphyllum): are presently the only non-native invasive ferns in Florida. Both ferns reproduce and spread readily by wind-blown spores. A single fertile leaflet can produce 28,600 spores. Animals, equipment, and even people that move through an area with climbing ferns are very likely to pick up spores and move them to other locations on the property or even to other properties. 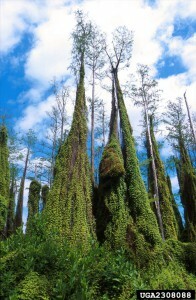 Old World climbing fern has been a problem for many years in central and south Florida but it is currently moving north. The first plant was documented in 1958 by a nursery in Delray Beach. By 1965, it was found in natural areas of Marion County. The northern edge of its advance by 2012 was Hernando County on the Gulf side and Duval County on the Atlantic coast. 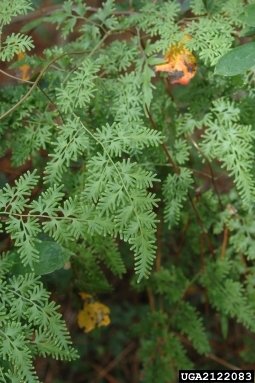 control Japanese climbing fern. However, when the plant is growing in areas adjacent to wetlands or water, fewer herbicides are registered for those sites. Hand digging is also an option, except when the fern is producing spore covered leaflets. Disturbing it then would propagate more plants. For more information contact Les Harrison, UF/IFAS Extension Wakulla County – Agriculture & Natural Resources Extension Agent by phone at 850-926-3931.